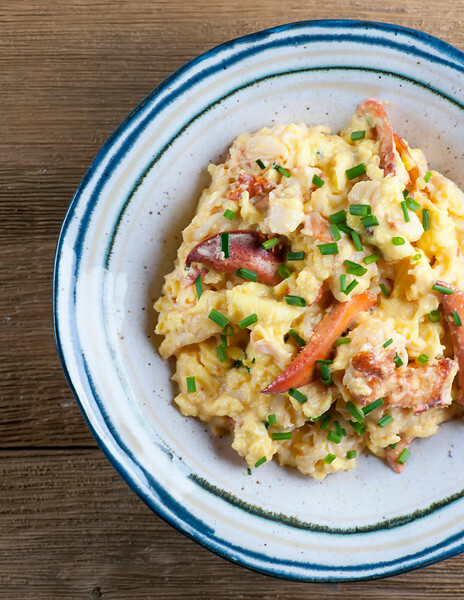 Yes, lobster scrambled eggs are comfort food on top of comfort food on top of comfort food. It is the ultimate cure for a bad day, or the ultimate reward for a good one. Because lobster doesn’t have to be for a special occasion – the special occasion can be taking care of you, or someone you love and adore. And this easy recipe divides one lobster among two happy people, so it doesn’t break the bank either. Ready for the best comfort food ever? Let’s make it! I will admit right here and now that I am not capable of cooking a lobster myself, so if you are in my camp you can do what I do, which is to ask your friendly neighborhood seafood counter person at the supermarket to steam it for you. I go to the seafood counter first, ask for my steamed lobster and then go about the rest of my shopping, since the steaming usually takes about 10 minutes or so. Then when we get home, the Southern husband grabs the kitchen shears and gets to work. If you need a quick overview on how to shell a lobster, here’s a handy video for you. Once your lobster meat is out of the shell, all that’s left to do is gently scramble some eggs, fold in the lobster, ladle it out into warm bowls and sprinkle on some salt and pepper and chopped chives. 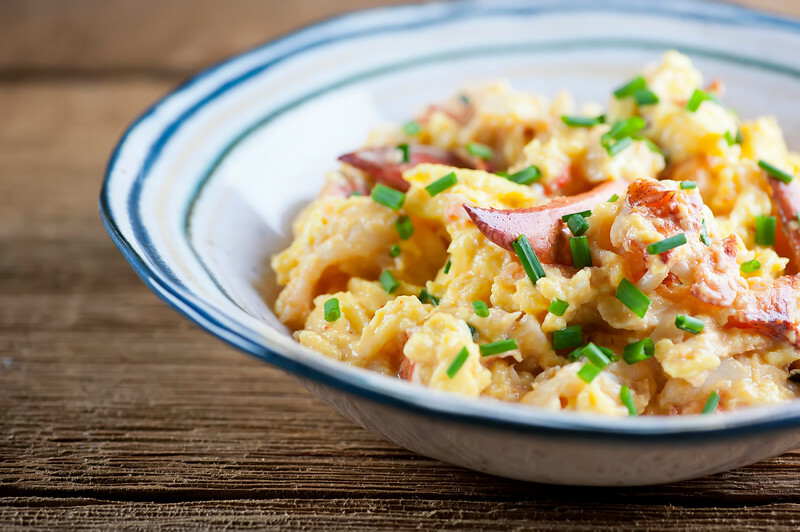 Lobster scrambled eggs. Because you’re worth it! Heat 1 tablespoon butter over medium heat and add lobster. Cook for about one minute or until warm. Set aside. Heat remaining tablespoon of butter in same skillet over medium heat. Whisk eggs and cream until totally combined. Add eggs to skillet and stir briskly and constantly until soft curds form. Remove immediately – they will keep cooking even after they are off the heat. Fold in lobster. Divide among two warmed bowls, sprinkling with salt and pepper and chopped chives.